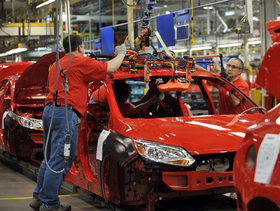 Ford workers assemble the new Focus compact car in Wayne, Mich., in March. The automaker had to find nonmetallic black and metallic red paints to replace colors that were not available after the March 11 Japan earthquake. TOKYO -- Merck KGaA, the German pigment maker whose lost production forced some carmakers to stop taking orders for cars of certain colors, has resumed operations at its earthquake-damaged plant in Japan several weeks ahead of schedule. Merck resumed production at its Onahama factory on Sunday, the company said in a statement. It expects to reach full production in June. The company previously said the plant would restart around June 1. Merck closed the plant after the March 11 earthquake and tsunami that ravaged northeastern Japan. Merck, which is based in Darmstadt, has seven plants in Japan, but the damaged plant in Onahama is the only factory making its metallic pigment known as Xirallic. Honda, Ford and Chrysler were among the automakers offering Xirallic paint options. Orders for models with certain metallic finishes were suspended in some cases. Merck had said earlier that it needed to repair pipes and replace kilns that bake the pigment's aluminum flakes. It also took weeks to restore the water supply. Merck is planning to start production of Xirallic pigment at a site in Germany by the end of the year so that it has two sources of the product, Carter said.